Artificial turf is becoming more popular than ever before, and it continues to be used more and more in people’s homes, by schools, in offices and for sports pitches. It is no secret that it took a little while for artificial turf to take off; too many memories of playing football on sub-standard surfaces and scratchy material. As the concept and the manufacture developed and improved though, so too has its popularity. Artificial turf now comes in a range of types and styles and is favoured by many over natural grass gardens. Why is artificial grass so popular? With warmer weather and increased periods of heavy rainfall on the long-term weather forecast, the popularity of artificial lawns is expected to skyrocket. We go into more detail, dissecting the costs involved with installing artificial turf in our ‘How Much Does Artificial Grass Cost’ guide, but here’s an overview. We’ll cover the ins and outs of preparing your lawn for artificial turf when we discuss the installation process, but in terms of budget there are a couple of options. Either hire an expert to prepare your lawn for you or save money by doing it yourself. There are a few costs that will be involved, regardless of which option you choose. Skip hire will most likely be necessary if you’re going to do a thorough job, and if you are taking grass out, you’ll need to replace it with soil to level the lawn before installation. Skip hire will cost approximately £220, and top soil can be bought for about £30 per tonne, for example. To keep the numbers simple, we’ll base the following costs on a 10m2 garden, which is a little smaller than the average garden in the UK, but it’s pretty close. Assuming it’s not possible to get a digger around to the garden, which in many cases it isn’t, it would likely take a team of two a day to clear the garden. You might find that the process could be completed quicker if your lawn is made up of ideal soil. However, in some cases, the soil can be particularly hard or full of stones, so the safer estimate is for a full day – which will cost you around £350 - £400. As mentioned previously, you can save this cost by doing it yourself – but expect it to take longer than a couple of days, and you might still want to rent some tools to make the process a little easier. You can purchase cheap artificial grass for £10 per m2 or sometimes even less – but when you’re investing in artificial lawn, you don’t want cheap turf, you want cost-effective turf. 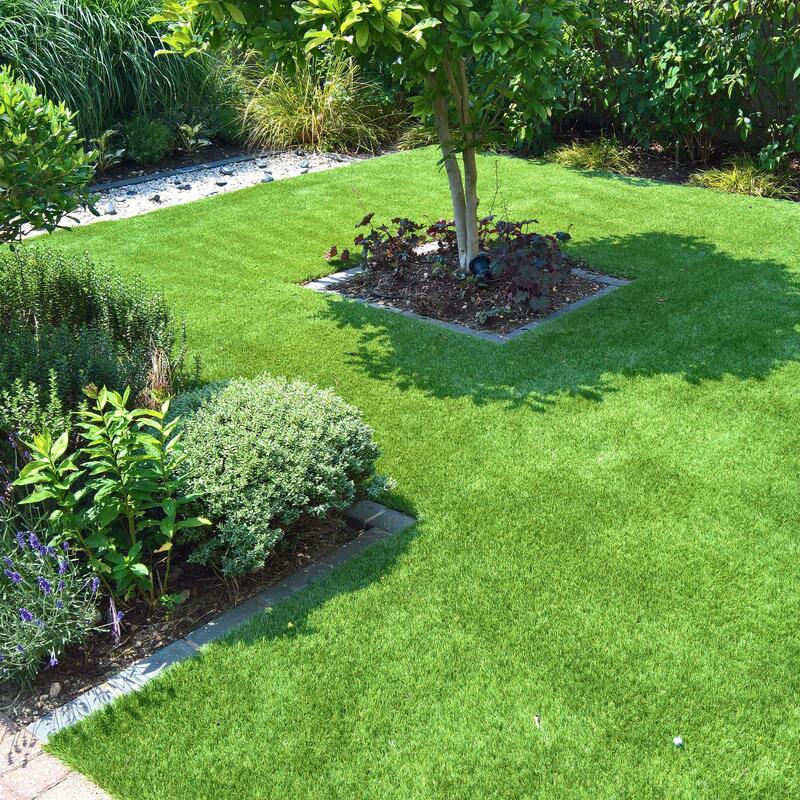 You still need the artificial grass to be top quality, otherwise you’ll just find yourself having to purchase more to reinstall in a few years’ time. You’re not likely to find quality artificial turf for much less than £15 per m2. For example, prices on our website start at £15.95 and go up to £25.95. It’s not wise to make your purchasing decision based on price alone though; you need to ensure you choose the right artificial turf for your needs. Around 50% of people try to lay artificial lawn themselves, and there are some fantastic guides online that walk you through the process step by step. We’d always recommend using a specialist installer to ensure that the result is a perfectly level lawn with a high-quality finish that will last for years and years. Installation costs vary significantly, but in general they are between £30 and £60 per m2. So, for the 10m2 lawn we prepared earlier, the installation cost would typically be between £300 and £600. This means that the total cost of preparing the lawn, purchasing quality artificial turf and installing it in a 10m2 garden would be between £1,000 and £1,500. All these numbers are estimated and rely on a lot of assumptions, so should therefore be used as a very rough guide. Each case is completely different, so the best thing to do is to get a quote for a complete installation. It is vital that you select the right artificial turf for your needs. Artificial grass has become much more sophisticated and there are some varieties that are perfect for pets, some that work well if you have children who will be running over it all day, and some that are more for show. This refers to the length of the blades of grass. Pile height varies significantly in different artificial grasses. As a rule, longer blades of grass look more lush and more natural. However, over time, very long blades can bend over themselves and result in a slightly flatter look, and there are many people who simply prefer a shorter pile height. All the different artificial turfs we supply are designed for longevity and range from 15mm pile height for ex Crufts lawn, to 40mm pile. We find that a 35mm pile height tends to be the most popular option. At this height your grass looks lush and natural, and with proper artificial grass maintenance, will keep its taller pile height. Artificial turf suppliers will always state the pile height of their turf, so this should be easy to determine when shopping. No one buys artificial turf with the intention that it won’t be durable; in some cases though, durability is more important. As long as you don’t purchase very cheap artificial turf, and you buy from a reputable provider, your grass will be durable enough to last many years if maintained properly. However, you need to question how much traffic your lawn will get to determine how durable your grass needs to be. If your lawn is purely for aesthetic purposes and just needs to look nice, then you’ll find most artificial grass is suitable. However, if you need a lawn that’s going to be played on by children, or used by pets, then you might need to select your artificial grass a bit more carefully. It goes without saying that you want a high-quality artificial turf. There are a few tricks that can be used to determine the quality of artificial grass, but by far the most effective and important is to request a sample and check for yourself. If an artificial grass supplier doesn’t offer samples – we would be very wary of using them. Synthetic grass comes in various shares of green, and there are many things to consider when choosing the right colour for your lawn. Many people choose a colour that will coordinate with their garden furniture, windows and doors, or even the brick colour of their house. Most people, however, tend to just request ‘the most natural’ colour. The main thing to look for if your main criteria is a ‘natural colour’ is the number of colours used in the artificial grass. Natural grass isn’t all one colour; it is a mix of greens and yellows. Cheaper artificial grass tends to be all one colour and a consistent length, while better quality varieties are a mix of three or more colours and have blades of slightly differing lengths. The pile type refers to the ‘style’ of the blades of grass. As mentioned in the previous section, cheaper varieties will have one consistent pile type; usually it is just ‘straight’ or ‘curled’. We find that the best artificial grass has a hybrid of both. Usually they are mainly straight, with curled blades included, to give a more natural look. Our personal preference is for a straight and curled pile type; however, it really is a matter of preference – Crufts, for example, use mainly curled pile types. If you’re looking for a guide on how to install artificial grass, we’ve got a step by step manual available. As an overview, here’s a breakdown of the process and some of our top tips. Let’s begin with a top tip – hire a skip! You’re going to have far too much turf and soil to dispose of to rely on your Garden Waste bin alone, and you will probably spend more in petrol on trips to the tip than you would on skip hire. Lawn preparation involves digging up existing turf, and re-covering with sand to create a level surface. We’re often asked whether you can lay artificial grass on top of natural grass, and the truthful answer is yes, you can – but we wouldn’t advise it. You will get a much better finish and a longer lasting lawn if you prepare properly. Find an artificial grass supplier, choose the grass that is right for you, and order. We recommend that you lay geotextile fabric on top of your layer of sand. This will prevent any weed growth through the surface’s drainage holes, which might damage your lawn in the long term. It is then time to roll out the artificial lawn. It is important to plan this stage, rather than simply launching into it. Even sketching out the space on a piece of paper will help as you want to make sure you are laying the lawn in a way that means as few cut sections as possible. When cutting the grass to shape and size, use a sharp Stanley knife or scissors for a clean cut. Take your time here, you want the lines to be as precise as possible. If you are going to need to join sections of artificial grass together, make sure you lay the turf with the pile running in the same direction; otherwise, it will be obvious where the joins are. Then scatter a layer of kiln dried sand to ensure the grass remains in position. Brush as you go, rather than after laying a full layer of sand, and brush the sand in the direction of the pile. It is vital that this is done immediately after the laying of the sand, while the surface and weather are both dry. We’ve simplified the process as much as possible and you’d still be forgiven for thinking that it sounds like quite a lot of work. If you are used to manual jobs like this, it’s not too bad, but if you are a novice, it can be time consuming and a challenge. That is why most suppliers will offer an installation service too; and if you use the official installers from an artificial lawn company, it is likely that they will use the same installers regularly – so they will be experienced and will provide an outstanding finish. You can, of course, find a third-party fitter. However, artificial grass installation is a bit of an art, so remember to ask them about their previous experience in doing so. Artificial grass can be a low maintenance and visually attractive solution for your lawn. While it is less maintenance in the long run, and it often requires less expenditure as there’s no need for weeding, seeding or mowing, it does involve an initial investment. If you are considering artificial turf for your lawn, remember to budget, choose the right turf for your needs, and consider the maintenance that is required.